Ardvreck castle was constructed around the year 1590 by Clan MacLeod who was the areas dominant clan from the 13th century onwards. The MacLeod clan held the castle and surrounding land until the year 1672 when Clan MacKenzie attacked and captured the castle and surrounding area of Assynt. In 1726 the MacKenzie clan built a modern manor house nearby called Calda house, which was destroyed only 11 years later in 1737 by a fire which was thought to be from arson. The castle was abandoned soon after this and now the house and castle both stand in ruins. The most well known historical tale concerning the castle is that on 30 April 1650 James Graham, the Marquess of Montrose, was captured by the Laird of Assynt and held at the castle before being transported to Edinburgh for trial and execution. Montrose was a royalist, fighting on the side of Charles I against the covenanters. Montrose was executed on 21 May 1650, by hanging, drawing and quartering. Archibald Campbell, Marquess of Argyll, a covenanter and Montrose's rival, was himself executed in 1661 after the restoration of the monarchy. Today the castle is in ruin and there's not much left to see, as only a small tower and a few wall lines can be seen. 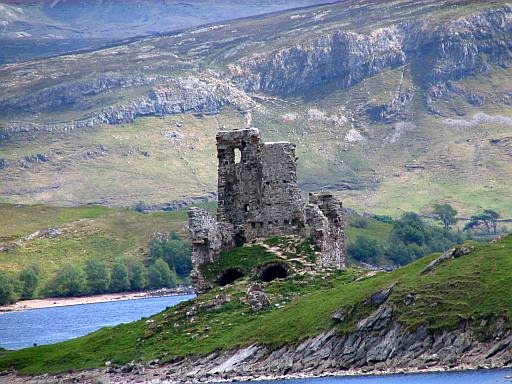 Ardvreck castle, loch and nearby Calda house are all thought to be haunted. As for the castle its home to two ghosts. One is seen as a tall men dressed all in grey and appears standing within the tower staring blankly at the ground, and thought to be the ghost of Montrose. The next ghost is that of a young girl and has quite a legend behind her. The story goes that when the MacLeod clan was in charge of the area they made a deal with the devil the help them build their castle there. In exchange for the Devils help he required a daughter of the clan's chieftain as payment, which the chieftain accepted. In despair of being sold to the devil the girl climbed the castle tower and jumped to her death. People claim to have heard crying noises within the tower from an unidentifiable source. The nearby ruins of Calda house are also supposed to be haunted. The legend says that the Mackenzie family organized a family gathering there one Saturday and that the celebrations continued past midnight into the sabbath day. At some point a fire broke out, possibly caused by a lightning strike, and all the inhabitants perished as the house burned to the ground. The causes of the fire are uncertain, but inhabitants of the Assynt area state that it was a manifestation of divine wrath as the family had been merry-making on the Lord's Sabbath day. Indeed, stories are told that there was a survivor of the fire, a piper who was spared the flames because he refused to play the pipes past the midnight hour. A number of ghost sightings have been recorded around the area of the Calda ruins, including that of a ghostly woman who haunts the site itself. Strange lights have also been seen there at night, and several people have claimed that they have seen car headlights approach them on the road there at night, but after waiting for the vehicle to pass, no car has appeared.